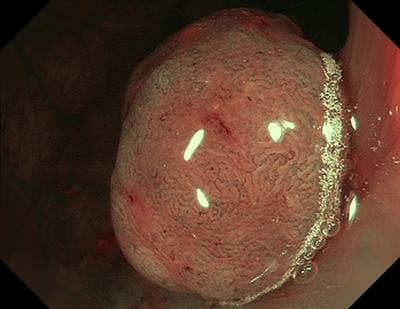 Die NICE (NBI-International-Colorectal-Endoscopic)-Klassifikation beruht auf Narrow Band Imaging-Bildern von Colonpolypen. Hierbei werden Farbe, Gefäßmuster und Oberflächenmuster einbezogen, um eine Unterscheidung von hyperplastischen und adenomatösen Colonpolypen endoskopisch vorzunehmen. Obwohl an Endoskope der Firma Olympus gebunden, sind ähnliche differential­diagnostische Überlegungen auch für Geräte anderer Firmen veröffentlicht. Die klinische Anwendung gilt im Prinzip für kleine Polypen (< 5 mm oder < 10 mm). Oberfläche: oval, tubulär, gyrös — Vorhandensein von Tubuli, linear oder als Konvolut, zentral hellerer Bereich, umgeben von braunen Gefäßen. 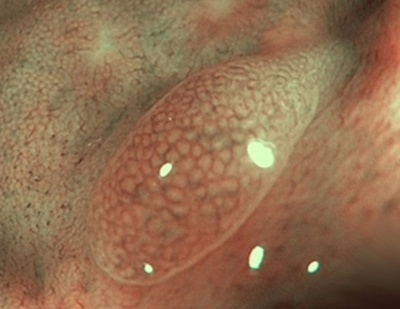 This classification can be applied using colonoscopes both with or without optical (zoom) magnification. * These structures (regular or irregular) may represent the pits and the epithelium of the crypt opening. 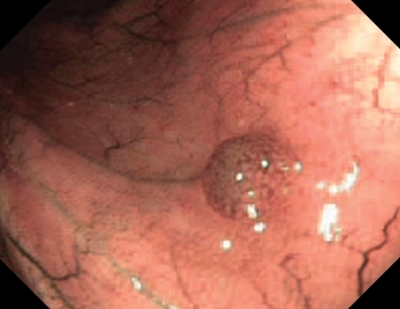 ** Type 2 consists of Vienna classification types 3, 4 and superficial 5 (all adenomas with either low or high grade dysplasia, or with superficial submucosal carcinoma). 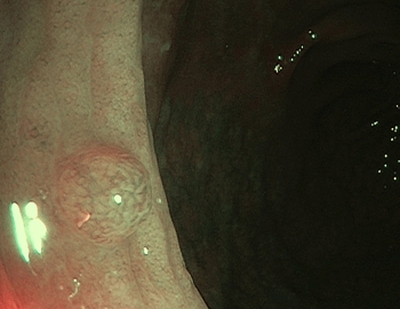 The presence of high grade dysplasia or superficial submucosal carcinoma may be suggested by an irregular vessel or surface pattern, and is often associated with atypical morphology (e.g., depressed area). Hewett DG, Kaltenbach T, Sano Y, Tanaka S, Saunders BP, Ponchon T, Soetikno R, Rex DK. 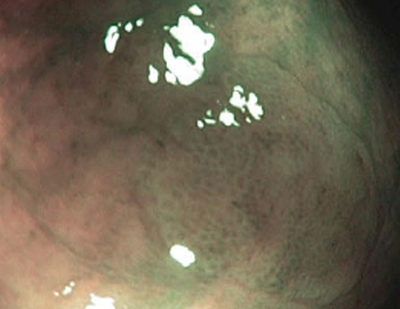 Validation of a simple classification system for endoscopic diagnosis of small colorectal polyps using narrow-band imaging. Gastroenterology. 2012 Sep;143(3):599-607.e1. 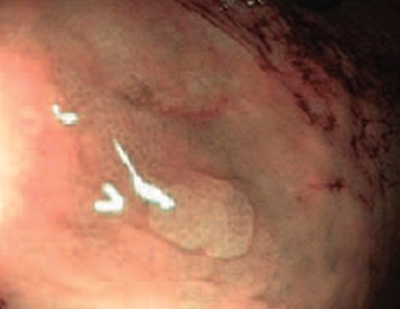 doi: 10.1053/j.gastro.2012.05.006. Epub 2012 May 15. Nagorni A, Bjelakovic G, Petrovic B. 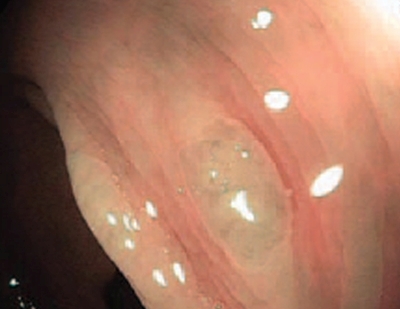 Narrow band imaging versus conventional white light colonoscopy for the detection of colorectal polyps. Cochrane Database Syst Rev. 2012 Jan 18;1:CD008361. doi: 10.1002/14651858.CD008361.pub2. 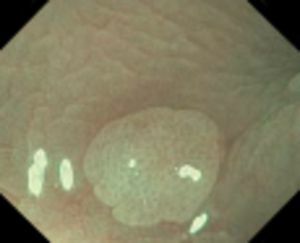 van den Broek FJ, Reitsma JB, Curvers WL, Fockens P, Dekker E. Systematic review of narrow-band imaging for the detection and differentiation of neoplastic and nonneoplastic lesions in the colon (with videos). 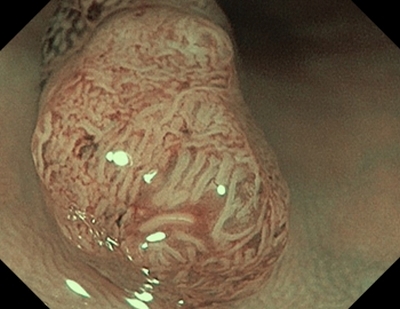 Gastrointest Endosc. 2009 Jan;69(1):124-35. doi: 10.1016/j.gie.2008.09.040. Rastogi A, Bansal A, Wani S, et al. 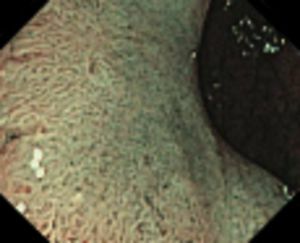 Narrow-band imaging colonoscopy–a pilot feasibility study for the detection of polyps and correlation of surface patterns with polyp histologic diagnosis. 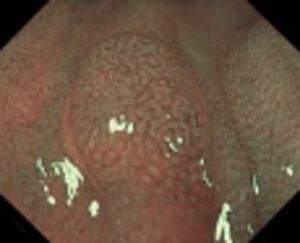 Gastrointest Endosc. 2008;67:280-6. Epub 2007 Dec 26. Rastogi A, Keighley J, Singh V, et al. 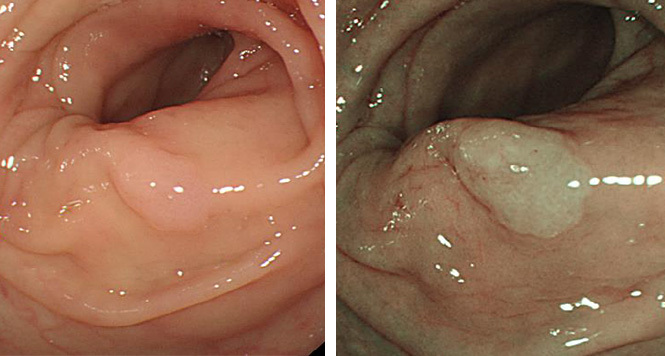 High accuracy of narrow band imaging without magnification for the real-time characterization of polyp histology and its comparison with high-definition white light colonoscopy: a prospective study. Am J Gastroenterol. 2009;104:2422-30. Epub 2009 Jul 7. Hassan C, Pickhardt PJ, Rex DK. 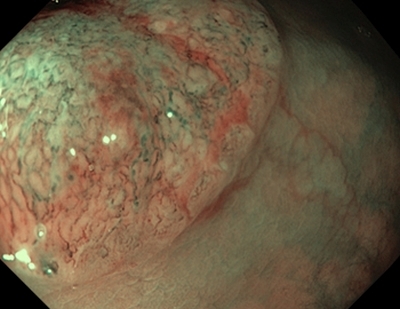 A resect and discard strategy would improve cost-effectiveness of colorectal cancer screening. 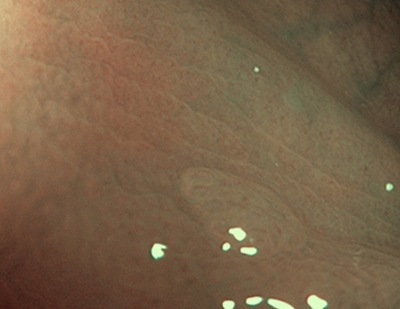 Clin Gastroenterol Hepatol. 2010;8:865-9, 869.e1-3. Epub 2010 Jun 1. 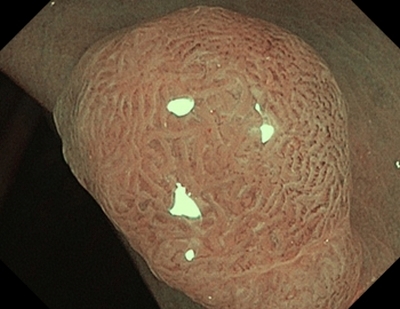 Wallace MB, Kiesslich R. Advances in endoscopic imaging of colorectal neoplasia. Gastroenterology. 2010;138:2140-50. Ladabaum U, Fioritto A, Mitani A, et al. 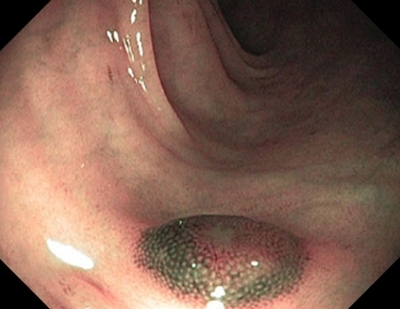 : Real-Time Optical Biopsy of Colon Polyps With Narrow Band Imaging in Community Practice Does Not Yet Meet Key Thresholds for Clinical Decisions. Gastroenterology. 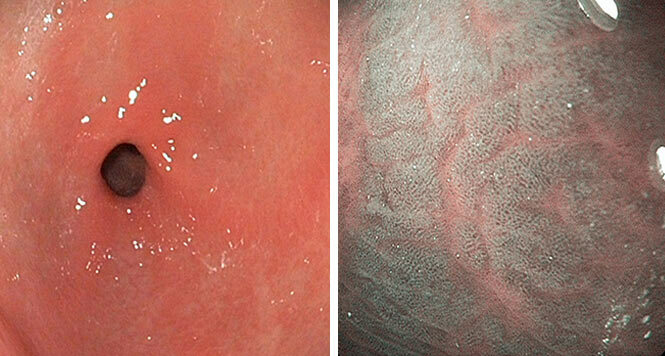 2013 Jan;144(1):81-91. doi: 10.1053/j.gastro.2012.09.054. Epub 2012 Oct 3. Schachschal G, Mayr M, Treszl A, Balzer K, Wegscheider K, Aschenbeck J, Aminalai A, Drossel R, Schröder A, Scheel M, Bothe CH, Bruhn JP, Burmeister W, Stange G, Bähr C, Kießlich R, Rösch T. Endoscopic versus histological characterisation of polyps during screening colonoscopy.Gut. 2014 Mar;63(3):458-65. doi: 10.1136/gutjnl-2013-304562. Epub 2013 Jun 28.